In our previous post, we shared five important tips for planning your dream Hawaiian outdoor wedding. Planning a wedding – especially an outdoor one – is no small task, so here are five more tips to help your planning go more smoothly. 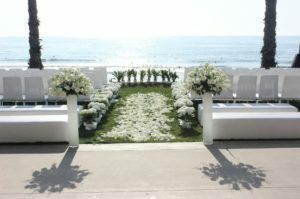 The weather plays a huge role in outdoor weddings. If it rains, you want to make sure you have a backup ready. You can choose to have the wedding outside and the reception indoors, and if it does rain, the ceremony can be easily moved into the reception hall. You can also rent a tent for the occasion. It’s important to choose a caterer that has experience with outdoor weddings. Be sure to choose foods that keep well in the heat. Avoid dishes with mayonnaise or anything that needs to be kept cold. Alcoholic beverages are dehydrating, especially if you are outside in hot weather. Be sure to provide plenty of water and other non-alcoholic drinks to keep guests hydrated throughout the wedding and reception. Our beverage dispensers offer a great way to serve water, lemonade, or tea, and you can store cold beers and other beverages in our chic galvanized bucket. When planning your wedding, you can sync up your timing with the sun for a dramatic effect. Imagine you and your partner saying your vows in front of a gorgeous, glowing sunset! Also, if you are having your wedding earlier in the day, orient your ceremony so that the sun will not be in your guests’ eyes. This is your big day, so choose high-quality wedding rentals in Oahu from EventAccents. Our décor and furniture will add class, elegance, and luxury to your wedding day. We work with each client to ensure that their big day is truly magical. Contact us today and start planning the destination wedding of your dreams.